If you keep your boat on the Gulf or Atlantic Coasts of the United States, you face the possibility of a hurricane striking during the second half of the year. If and when a hurricane strikes, proper preparation is the best way to help ensure that your boat survives. The following 10 tips are developed using information from the Marine Insurance Division of BoatUS, experts in hurricane preparation. Devise a comprehensive plan in advance: the sooner the better. 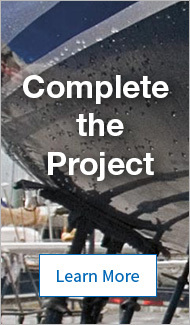 Use the comprehensive guide at the BoatUS Resource Center to get you started. Understand your insurance policy and your marina contract. Your policy may pay at up to 50 percent of the cost of hauling or moving your boat prior to a hurricane. Some marinas require that you haul your boat in advance of a storm to protect your boat and the marina. If you plan on hauling your boat, coordinate in advance with your marina. Evidence shows that boats stored on land fare better on average in a hurricane compared to boats kept in the water. When you haul, locate jack stands along the hull in areas reinforced by a bulkhead to withstand the pushing force of the wind. You should also chain the jack stands together to keep them from spreading apart. If jack stands are located on soft ground, be sure to place plywood pads under them to keep them from sinking into the ground. If you must moor your boat in the water during a hurricane, try to locate it in an area with the least amount of fetch, in other words, where waves have the least distance to build up. Canals are ideal, because lines can be run from both sides so the boat does not pound against the dock. Remember that the wind will veer around as the storm goes by, so be sure your boat is protected from a wide range of wind angles. "Hurricane holes" provide protection since they are completely enclosed. If your boat will be moored to a fixed dock or piling that does not ride up as the water level rises, you will need to use long lines so your boat can float up as the water level goes up. Lines that are too short can break or in some cases actually pull the piling out of the water. Tie up your boat with the bow facing the anticipated wind direction. This may be different from how you normally tie up. If you moor your boat to a floating dock, take note of the height of the pilings, which must be higher than the anticipated storm surge. If they are not, the entire dock will become a raft and take your boat with it. So if you think the pilings might be too short, get your boat out of the water. Boats on moorings face special challenges. Most moorings can withstand storms and squalls, but hurricanes place an extraordinary load on the anchor and anchor rode. The best anchors are helix types, which screw into the seabed. They hold much better than mushroom or deadweight anchors. According to Boat US tests, mushroom anchors hold about 2 1/2 times their dry weight. Concrete anchors hold about 1/2 of their dry weight. Helix anchors however, hold between 12,000 and 20,000 pounds and in the BoatUS test could not be pulled free. One problem with mushroom anchors is that they may have taken a set with the prevailing wind direction. The storm however, may come from a completely different direction. Also, if your boat will be on a mooring, or anchor, now is the time to replace or upgrade your mooring pennant, making sure that it has chafe protection. If you must anchor out, select your location so there is as little fetch as possible, so as to reduce the size of the waves. Two or even three anchors can be used. One approach is to set two anchors in linear formation connected together by chain or in multiple directions at 90 degrees to the anticipated direction of the wind. Three anchors can be set in an array of 120 degrees and led to a single swivel and line leading to the boat’s bow. This can be especially effective where the boat has little room to swing. Now is also time to get rid of your worn dock lines. According to Practical Sailor Tests, old lines lose 49-75 percent of their strength. Lines should nylon, either two or three strand and in many cases larger than what you normally use. Reduce the possibility of your dock lines breaking due to chafe by installing chafing gear, which is inexpensive and easy to install. You can also switch to dock lines with a thimble spliced to the end, through which a short length of chain is run that is shackled to the dock cleat. To reduce stress on your dock lines, mooring compensators, or snubbers can also be used. You can do this by removing all canvas, including dodgers and biminis. Furling genoas should be removed, halyards should be attached to a small line and run to the top of the mast. Mainsail covers and mainsails should be removed. Cockpit covers for powerboats should be removed. Even if the storm does not damage your boat, it is likely that your canvas will be damaged or destroyed by wind or debris in the air.